Preheat the oven to 325º. Lightly brush a 9-by-13-inch metal baking pan with butter. In a medium saucepan, cook the 2 1/2 sticks of butter over moderate heat until golden brown, 5 minutes. Transfer to a large bowl and let cool to room temperature, 30 minutes. Add the sugar, eggs, almond butter, vanilla, salt and cinnamon to the butter and whisk until smooth. Stir in the flour, then fold in 1 1/2 cups of the almonds and 1 1/2 cups of the chocolate chips. Scrape the batter into the prepared pan and spread it evenly with an offset or a nonstick spatula. Scatter the remaining 1/2 cup of almonds and 1/4 cup of chocolate chips over the top. Bake for about 1 hour, until a toothpick inserted in the center comes out with a few moist crumbs attached. 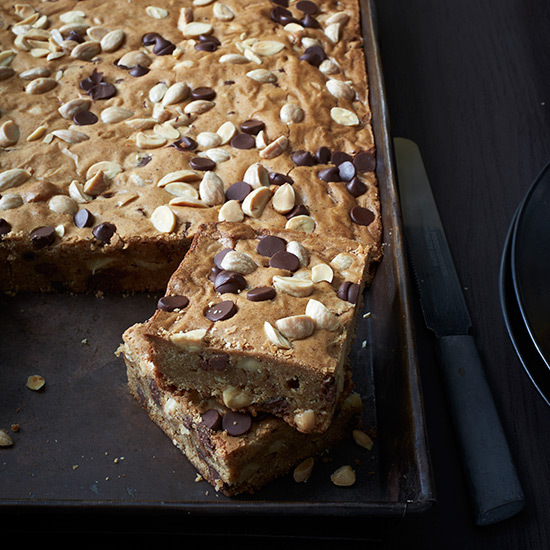 Transfer the pan to a rack and let the blondies cool completely before cutting. The blondies can be kept in an airtight container for up to 3 days or wrapped in foil and frozen for up to 3 months.